The NBA Global Games have transformed the NBA into a International games. Now playing in many countries around the world, I look at the history and some of the most exciting and controversial games in the games' 36 year history. 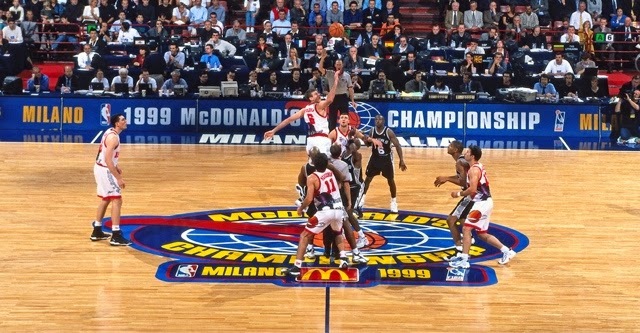 The first ever game played between an NBA franchise and an International team (governed by FIBA) was highly anticipated. The intrest in the NBA was waining and commissioner Larry O'Brien decided that as well as the ABA-NBA merge, he would try to increase the interest in the league by trying to transform it into an international brand. Although the game it's self was disappointing if you were a Washington fan, the rest of the world were able to view a great game where the underdogs managed to secure a one-point game. After a thrilling 48 minutes the teams could not be split. However the official reportedly said 'Is just exhibition, no?' This suggested that the Atlanta Hawks who had traveled half way across the world would be leaving with a draw. However Atlata Hawks coach Mike Fratello convinced the Lithuanian official that overtime should be played. The Atlanta Hawks went on to win the game with the human highlight film Dominique Wilkins going for a game high 29 points. When the New York Knicks took on Scavolini Pesaro most fans around the world wrote off the Spanish team. However the game couldn't have been any different to the expectations surrounding it. The Knicks relied heavily on star big man Patrick Ewing, where as Scavolini played good team basketball. With 30 seconds left in regulation the Knicks trailed by three. Gerald Wilkins makes one of the most clutch treys ever seen in the Global Games. The Knicks go on to win in overtime. Patrick Ewing finishes with 34 Points 17 rebounds and 8 blocks. The Houston Rockets took on the Minesota Timberwolves in Mexico City the stars on show included Dwight Howard and James Harden along with a Minesota side that have much young talent including two 1st overall picks in Andrew Wiggins and Anthony Bennet. Although Minesota but together some good runs and Andrew Wiggins got an emphatic slam in the 1st. Houstons class showed in the 4th and they pulled away from the Timberwolves. Dwight Howard finished with an impressive 22 points and 10 rebounds. The NBA Global Games has become a staple go-to event in some countries. With the competition becoming much harder for NBA teams they are more inclined to go to these international venues. For the NBA to stay as one of the premier sports leagues in the world it must continue to makes links across the globe. Commissioner David Stern (retired this year) should be commended on continuing the work of Larry O'Brien and we can all expect that Adam Silver will do the same. A look at the development of the NBA as an International brand, including the history, controversy and future.